Melbourne garage workhorses Pinch Points are back today with the announcement of their forthcoming debut album and a first taste that we’re thrilled to be premiering - ‘Shibboleth’’ is a propulsive blast of their wiry and erratic punk that serves as a striking reminder of why they’re one of the country’s most exciting young bands. 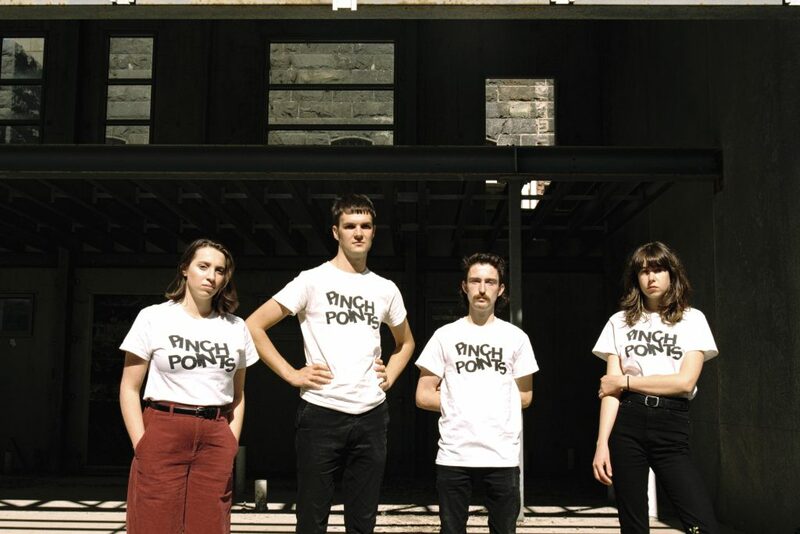 Few bands in Melbourne have had as strong an introductory year as the enigmatic Pinch Points. After suddenly appearing fully-formed out of nowhere in early 2018, they spent the rest of the year taking over the local music scene with their brand of aggravated garage-punk, and received some huge accolades for their debut tape Mechanical Injury while they were at it. Not one to rest on their laurels, they’re back today to announce the release of their debut full-length Moving Parts, and if ‘Shibboleth’ is anything to go by, the new record is set to see them kicking some huge goals. Despite being instantly recognisable from its signature wiry guitars and metallic tones, ’Shibboleth’ opens in a deceptively calm manner - that is, until the band pull a sudden pace shift and hit us with a barrage of their familiarly erratic punk. While a propulsive rhythm section careens beneath razor sharp guitars, guitarist/vocalist Adam Smith takes the reins with his raucous yelp and draws a caricature of a local music scene hero… well, not exactly his hero, but apparently someone’s. With his sardonic lyrics and unapologetic jeer, Adam challenges our allegiance to the scene and their supposed rules, hitting his point home with each melody-less hook and punchy gang vocal as the band rockets along underneath. Fuelled by their jagged guitar interplay and a heap of chaotic energy, it’s a striking return for Pinch Points that signals some very exciting things are to come from the forthcoming album. To celebrate the new release, we got in touch with the band to find out a little more about ‘Shibboleth’ and what’s to come from Moving Parts. TJ: We’ve just had the pleasure of premiering ‘Shibboleth’ and it’s a blast. What’s the story behind the track? PP: The main drive of the song was the idea of gatekeepers around the scene and the way people feel they need to go through them for success. Just cause someone looks like you, dresses like you and says all the right things, doesn't mean they're in your corner - and stoking people's egos like that isn't healthy. Also shibboleth is a cool, niche word. It’s also the first taste of your forthcoming album, tell us about how Moving Parts has come together. The process was a lot rockier than we would've liked. Most of the songs came together last minute, to the point where we were learning parts and rearranging structures an hour before turning on the mics - while it made it an interesting challenge, it definitely wasn't ideal. Doing everything ourselves (recording, mixing, artwork etc) gave us the freedom to move quickly, but at times the pace was so hectic that we spun out of control and had to course-correct a lot. Since you aren't depending on anyone else, DIY can make you fast ([debut tape] Mechanical Injury took two days) or it can make you faff around (Moving Parts took three months). Mechanical Injury was a pretty powerful way to introduce the band to the world, and was very well received as a result - will the new album find you looking in new directions or doing what Pinch Points does best? From the beginning we wanted to do something that took Injury and just dialed everything up. Since it took so long, we spent our spare time fine-tuning as much as we could, trying to get the whole sound more transparent and aggressive. The bass and guitars aren't as clean and we wanted the drums to feel like they were pinning you against the wall. There are a few riffs and lyrics pulled almost directly from Injury and repurposed, and a few bits written in response to the first release. The central image of Injury was society as machine; Moving Parts is about the cogs in that machine, and what it's like to be a human churning in the engine room, playing your part and trying not to miss a step. Also there's more guitar solos - why not? It’s hard to believe it’s only been a year since Pinch Points starting playing considering how many huge goals you’ve already kicked - how have the last 12 months been for the band? None of us really had any expectations when we started but then it just kicked off. Our original drummer Zev had to leave the continent, but Issy fit right in - an absolute legend. People on Bandcamp took Injury and ran with it all over the world, and working with Roolette Records locally is a joy. We’ve met so many lovely and inspiring people involved in the Melbourne music scene who are dedicated to breaking down the Melbourne boy’s club, and had a few run-ins with a couple of nasties who we’ll continue to dedicate songs to - cause it matters what you say and it matters how you say it. Have a listen to 'Shibboleth' above and head to pinchpoints.bandcamp.com to pre-order the forthcoming album on 12" vinyl before, it drops late next month. Pinch Points will be launching Moving Parts on Sunday, June 9th, at the Northcote Social Club.